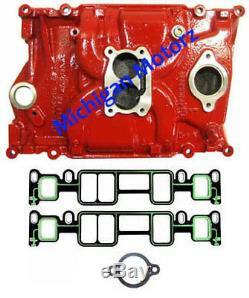 4.3L Volvo Penta Intake Manifold (1996-Later) w/ Intake Gaskets - 3855805 RED. Volvo Penta4.3L 2 barrel Intake Manifold - RED Also 100% compatible with4.3L - 2 bbl. Carb MerCruiser engines(1996-Later) Brand new genuine Volvo Penta Vortec 4.3L, 2-barrel, intake manifold. Made of cast iron, this intake is easily identified by the 8 bolts required to bolt to the cylinder heads. (Previous generation 4.3L engines require 12 bolts). If you have a 1996-Later, 4.3L MerCruiser, Volvo Penta, OMC, etc. Engine with a 2 barrel carburetor, then this is your EXACT intake manifold. Includes:4.3L intake manifold gaskets MerCruiser #27-824326002Volvo Penta #3855807OMC #3855807Crusader #7150950Manifold part #3855805. Family-owned and operated, Michigan Motorz is your "One-Stop Online Shop" for Marine engines and parts, with our fully-stocked 33,000 sq ft showroom and knowledgeable sales associates ready to help. Items will be dispatched with in 24Hrs of order (except weekends and holidays). Other Items You May Like. Powered by Solid Commerce The All-in-One Listing, Inventory & Order Management Solution. The item "4.3L Volvo Penta Intake Manifold (1996-Later) with Intake Gaskets 3855805 RED" is in sale since Monday, October 12, 2015. This item is in the category "eBay Motors\Parts & Accessories\Boat Parts\Inboard Engines & Components\Intake & Fuel Systems". The seller is "michiganmotors" and is located in Madison Heights, Michigan. This item can be shipped worldwide.